This little sweet girl, Kristen is now in her furever home with Megan, Kevin and Dozer. Her new home is in Harrison and her new name is SCOUT! 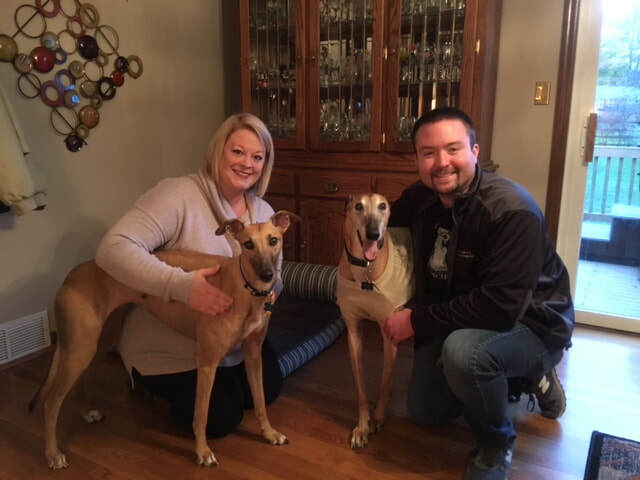 Their other greyhound, Kona had passed away unexpectedly a couple weeks ago and Dozer was grieving and needed another friend asap. They have an little habanese dog not pictured but just not a greyhound. This adoption was meant to be, both dogs were thrilled to see each other, lots of tail wagging and smelling. Megan and Kevin loved that she is so tiny!